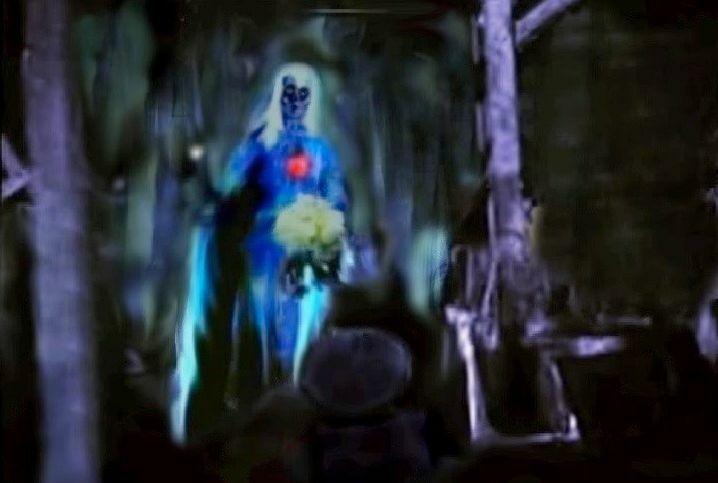 In evaluating the thematic cohesion of the original attic, in which the two blast-up ghosts foreshadowed the Hat Box Ghost, who in turn was husband to the Beating Heart bride, I thought it would be helpful to re-create the original bride in her original position as much as possible, showing how the second blast-up may have looked positioned directly in front of her. It should be stipulated that it is possible that no blast-up was in that location when the HM opened. The blueprints show that as of May 1969 there was no popup planned for there. They show instead a popup at the right side of the attic exit, just inside the attic. I have no recollection of that arrangement, and I suspect but cannot now prove that they decided to move the popup (a blast-up type) to its position in front of the bride before the ride opened. A blast-up was in that spot until Constance showed up in 2005, and no one seems to remember a popup by the exit. According to Tony Baxter, documentary evidence suggests that "a lot of drapery material made from transparent plastic" was there with the bride. In reality, we now know (thanks to new evidence rediscovered in August 2013) that between the two attic posts in front of her was stretched, floor to ceiling and post to post, a sheet of plastic or nylon, and perhaps this is the fabric that Tony was referring to. It probably would have served the purpose of making her look cloudier or distorted. This accords very well with my personal memories, which I described in 2007 like this: "Well, when we saw her there 8/14/69 my brother and I both thought she looked murky. The fabric [of which Tony B spoke] plus the figure plus the adjacent wooden attic structure almost made her look like she was standing in a doorway or cabinet or something. My theory is that they were worried that a simple figure so close to the track would just look like a mannequin, and they deliberately tried to obscure her a bit." At that time I knew nothing about the plastic/nylon screen between the parallel attic posts. That would explain the impression of her standing in a cabinet or doorway. 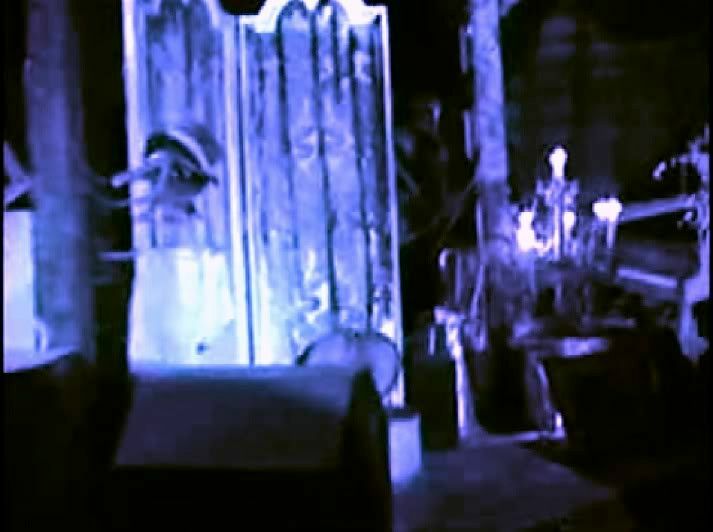 There are no photos, but some murky film footage emerged in July of 2011, and together with other clues we have established that this version of Beating Heart was the "Corpse Bride" version. I've worked up a pair of photoshops of the scene, one with the blast-up hidden and one with it in sight. If this is indeed what was there originally, the way the two figures were arranged violently juxtaposed them. Their relationship would have been made clear by the Hat Box Ghost. Just to get your bearings, here's the same scene pre-Constance, in 2002. Note the piano on the far right, added in 1995. 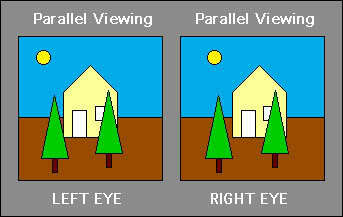 And here's the same scene today, uglified by the flash but useful for getting your spatial orientation. 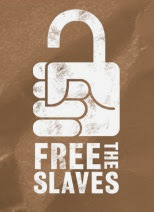 I just came across your blog and I got to say this is awesome! I'm now glad that the Haunted Mansion has "in-depth" blog since, the Ghost Relations Department discontinued. I have a question that you might be able to answer since it's appropriate for this post. 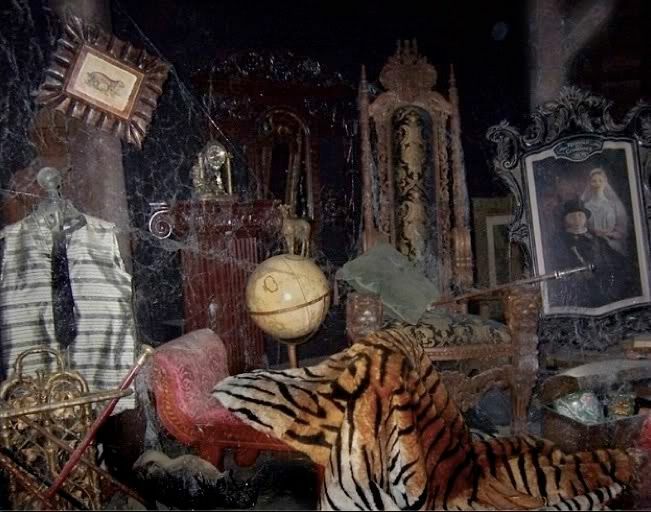 If you watch the Osmond's trip to the Haunted Mansion, there is a brief attic scene. If you pause at 9:16,(to the left of where Donny Osmond is pointing at) there's an anonymous figure. Could that be the newly positioned bride at WDL or WDW of 1971? It's not certain, but it's very likely that it is the bride. It doesn't mean very much. The Osmonds episode was filmed in Jan or Feb 1970 (at DL, of course), and by then the bride had been in the HBG's old spot for months, the spot she would continue to occupy until 2006. The film is not nearly detailed enough to say anything definite about her appearance, but it would have been the familiar dark-faced bride by then. ...the notice OF HM fans. Thank you so much for the reply- I will be looking out for more blog posts of yours! Wow! Snow White has always had a thing for dark scary places, and there's none better than the Haunted Mansion. Looking forward to more great posts. Just became a follower. Excellent, and welcome. Being the second scary dark ride in the park, the HM owes a number of interesting debts to the first. That topic has come up several times on the "Long-Forgotten" threads and no doubt will be a blog topic here sooner or later. In truth, we were never married. Although I tried, I couldn't help but gawk and leer at other women and — well — everyone. The Disney Company allowed the bride with the telltale heart condition and I to deceive the visiting public in order to avoid a scandal. Now that I think about it, that could be the real reason why I was thrown out. That business about the lights not working was just one more cover-up. You know, I hate to be the one to break it to you (why, it's breaking my little heart, it is), but the truth has been out for some time. The certificate of authenticity accompanying the HBG big fig calls him a "skeletal suitor" and a "malevolent mate" who "jilted" the bride "once and for all." I'll grant you that this report betrays a pro-bride bias. I might have been inclined to indulge in a little "malevolent jilting" myself if my bride-to-be evidenced homicidal tendencies (first latent, later blatant). Still, I'm afraid your confession is too little and too late; the fit hit the shan years ago. Of course, I left Bridezilla standing at the altar! Who could listen to that infernal, incessant beating for ALL ETERNITY!? But that certificate is pure LIBEL, I tell you! It's character RE-assassination!! Do I look "MALEVOLENT" to YOU??? Oh yes, NOW you can repudiate your original intentions toward her as loudly as you wish; the fact is, Constance has ta-ta's till Tuesday. Hey, with some guys such things outweigh other considerations, like, you know, that Lizzie Borden thing. Just sayin'. The word "leer" does seem to find its way into a significant percentage of conversations about you. Just sayin'. I've seen both of her. Rumor has it she qualifies for group insurance. 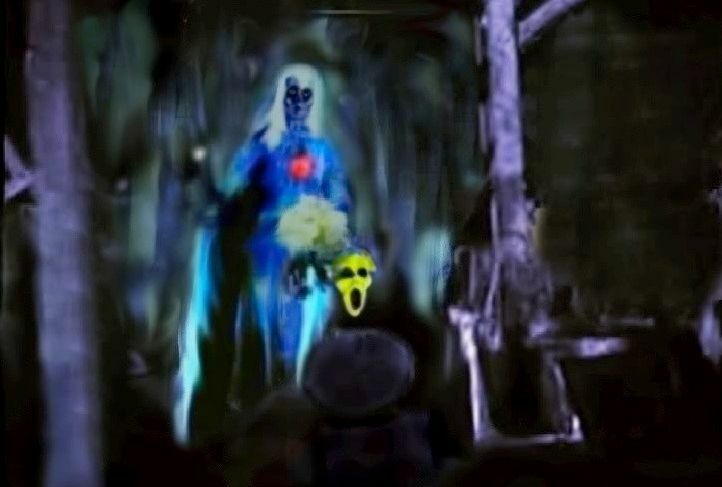 Was the Skull Bride meant to be the first and original brife before Glowing Eyes Bride??? I was looking back over this post, and I noticed that the blast-up head in your photoshopped recreation looks like it has hair, but it doesn't look like the one in the picture from GRD's collection. Is the "hair" just an artifact, or is that from a different image of a blast-up with hair? And if it is from a different image, where and when was it taken? Because hair almost certainly means the first-generation mounting system, and I haven't seen any other examples of that in use. It's created from a different photo, and I added hair, because they had hair. Interesting. None of the pictures I've seen of blast-ups in their natural habitat have hair - but then again, those pictures are mostly more recently taken. Do you recall about when they stopped having hair? They all had hair back in the day. I don't know when they lost it. Thanks, that's still very interesting info. If my theory about the mounting systems is right, then whenever they lost their hair is also probably when they switched over to the second mounting system. The fact that they had hair at all for a significant portion of the Mansion's history suggests that heads like GRD's may not in fact be prototypes like I thought, but actually operating props from a time when it was really hard to take a picture of a fast-moving head in dim lighting. Oh well - I guess I'm off to trawl through every picture out there of blast-ups to see if there's one with hair I missed, then. Thanks again!